A scholarship brought Joe to Arizona and Eastern Arizona College in 1961. In basketball he was a 1st Team All-Southwestern member. Joe then entered Arizona State College in Flagstaff (now knows as NAU) where he also played basketball and was named Most Inspirational Player for the 1964-65 season. In 1966 Joe began his coaching career in Marana, AZ., where he would couach JV-football for 3 years, Baseball for 6 years. He was the Boy’s Varsity Basketball Coach from 1973-2004. During that time he also coached Varsity Girls Softball for 5 years. Joe’s Baseball team won the state championship in 1969 and he was selected Coach of the Year. In Basketball, he was chosen Conference Coach of the Year six times; his 3A-Level teams were Conference Champions three times and when his teams moved to the 4A-Level they were Conference Champions five times. His teams made the State Playoffs 10-times. In addition to coaching at Marana High School Joe was the founder and director of the Marana Youth Basketball Camp for 33-years. He was also the Director of the Boys/Girls Summer Basketball League. He has also coached at Basketball Camps for the Tucson Gunners, the YMCA, Pepperdine University and the Pete Carril Camps. 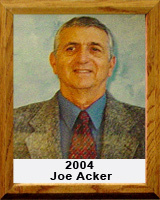 Joe has been a member of the Arizona Coaches Association for more than 30 years. Currently (2007) he is coaching Varsity Basketball at North Canyon High School in Phoenix, Arizona,.